Guante: Two more reviews of the new album! Here's one from Dane101, the premier online media source in Madison, WI. "... has worked hard to create a style and flow uniquely his own. He has also made a habit of exploring issues at greater length and depth than most rappers ever do. On his newest record, An Unwelcome Guest, Guante somehow manages to push the envelope even further." And here's one from Reviler, an upstart Twin Cities music site with some great stuff. "...one of the best rappers in the Twin Cities today, not to mention its best spoken word poet." Also, here's my interview in the MN Daily, the University of Minnesota's student paper. 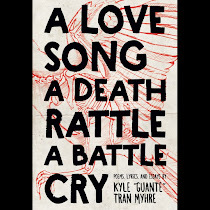 "Over bandmate Big Cats!’s layered, dark beats, rapper Guante is an avalanche of words."